The UF VETS team is capable of assisting with high and low angle technical rescue emergencies from holes, gorges, mud, water, overturned trailers, etc. and is equipped with ropes, slings, rigging equipment, rescue glides, and portable high points. Skilled team members are trained in a variety of technical rescue disciplines including animal technical rescue, human rope rescue, confined space rescue, and swift-water rescue. 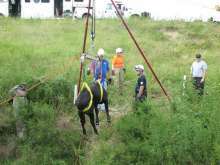 A team of qualified animal technical rescue responders can be requested by EMAC to nearby states during disaster events. The team can deploy with three trucks, a technical rescue equipment trailer, and a basecamp trailer. Sufficient fuel, water, and food can be transported to keep the team self-contained. Owners with an animal in a technical rescue emergency should contact their local 911 for assistance. Alachua County Sheriff’s Office has deputies trained in responding to these types of incidents and have a working relationship with the UF VETS team for additional assistance when needed. 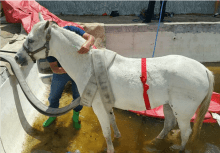 The VETS team will respond in the assistance of local fire or law enforcement but cannot respond independently to calls directly from the public. Surrounding county dispatchers can request UF VETS through mutual aid by contacting the Alachua County Sheriff’s Dispatch to contact the UF VETS team. The following counties are within UF VETS span of response: Alachua, Baker, Bradford, Citrus, Clay, Columbia, Dixie, Duval, Flagler, Gilchrist, Hamilton, Lafayette, Lake, Levy, Madison, Marion, Nassau, Putnam, St. Johns, Sumter, Suwanee, Taylor, Union, and Volusia. 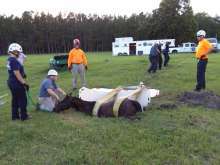 UF VETS does not charge for animal technical rescue responses. We rely on donations from the public to support the costs of transportation for our rescue rig, equipment use and cleaning, and ongoing training to ensure that our team is prepared to provide safe and effective responses.